Nowadays, there are already employees who select to send an online notice of resignation rather than handling the physical document to their immediate supervisors. Creating a resignation letter and sending it as an e-mail message may be accepted by companies depending on the resignation policies implemented by the management in its operations. There are a lot of reasons why employees decide to quit their jobs. Whether a physical resignation letter or an email resignation letter that you will use in doing so, what is important is for the document to be well-written. Assure that all the information that you would like to put in your resignation letter will be presented in the email. Make sure that your resignation email message will still look and sound professional. A formal document used in corporate transactions should always be well thought of especially with the language that you will use and the sentence constructions that you will apply in content creation. You may put your resignation letter in the body of your email. The structure and format of your resignation email message will depend on the electronic mailing site that you will use. 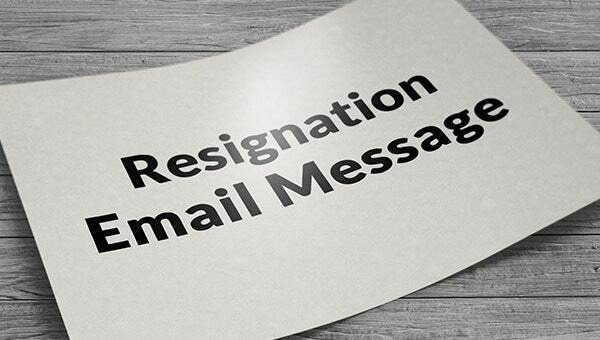 In using this kind of resignation email, make sure that you have a precise email subject line as you will no longer have a space in the body for the resignation introduction. You may use your resignation letter as an attachment. You may just save the edited resignation letter template that you will use once you are already done filling the needed information that you need to supply to the management of the company where you will be resigning. Attach it to your resignation email and create a preview message for your resignation document in the email body. When your resignation is immediate and you cannot go to the office to hand a physical resignation letter anymore. If company policy the usage of email resignation letters. If you are not comfortable in handling a resignation letter sample to your immediate supervisor, which you can later on do if they would request you to do so.